Just add urine and read results (In as early as 2 minutes).....it's that easy. 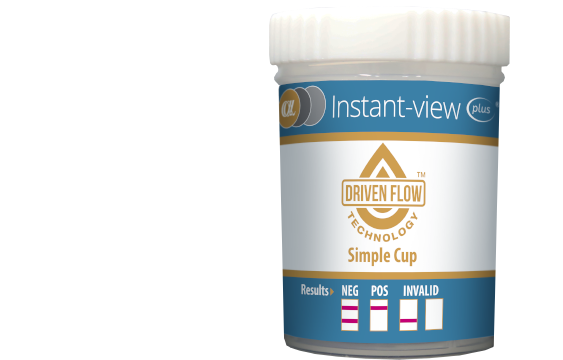 Driven Flow™ Technology utilizes a tightly restricted sample flow-path and the additional flow acceleration, termed Driven Flow™, provided by mechanically squeezing the liquid sample matrix through the device. Much like the pump used in High Performance Liquid Chromatography (HPLC), this squeezing action produces the powerful driving force to push the flow past the reaction area evenly, at high speed while generating maximum, thorough reaction of the binding complexes. This flow also provides a strong self-washing function that minimizes non-specific binding in the reaction area. Results as early as 2 minutes. No need for refrigeration or wait times for reagents to warm up. Tests can be run immediately as needed. Built-in control to validate results. Please Note: THIS PRODUCT WILL SHIP TO HEALTHCARE, TRAINING FACILITIES OR HEALTHCARE PROFESSIONALS ONLY.